If you have been following the blog for a while, you know that I love all types of photography. 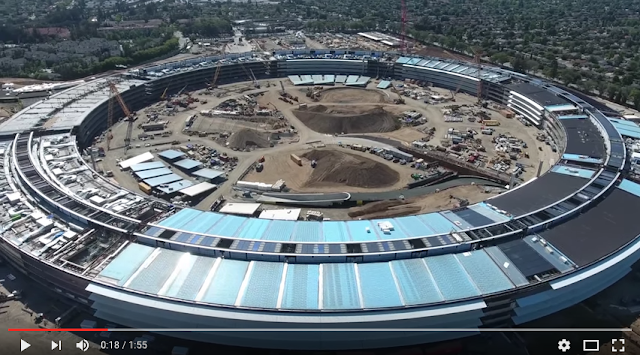 But I have to say that using drones to get aerial photos is one of my favorite things to do. And, although I have never claimed to be a videographer, it is the rare time that I love shooting and editing video. A little while back, I got my hands on the new DJI Phantom 4 aerial camera (also known as a drone) and been taking it on some day trips to capture photos and videos from unique perspectives. 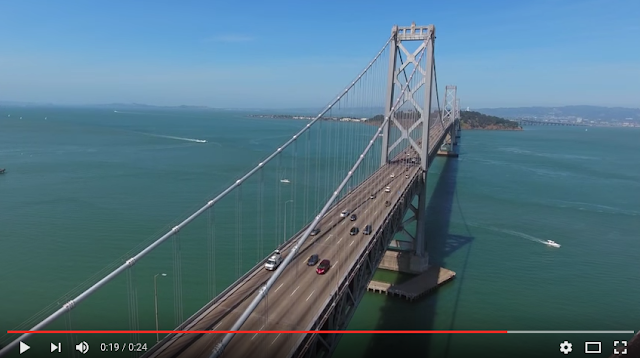 My first flight with the Phantom 4 was a flight by the Bay Bridge in San Francisco. Even though it was a fairly windy day, you would never know that from the steadiness of P4 gimbal. The 4K video looks stunning directly from the camera. My second flight was over the California Coastline. And on this day, it was INCREDIBLY windy. So much so, that I had to launch the Phantom 4 from behind my car so that I could get it in the air without blowing over. 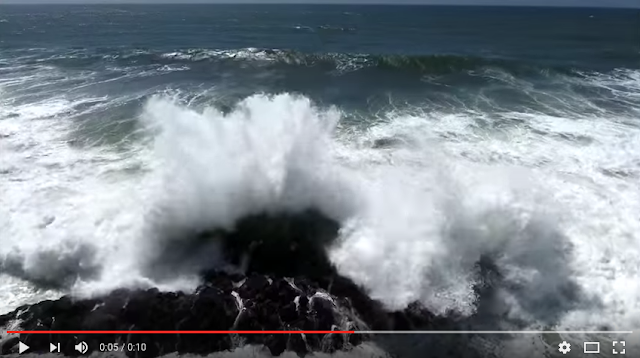 Even in this blustering wind, I was able to maneuver the drone exactly where I wanted it. Compared to the Phantom 2 and Phantom 3, this new version seems to be easier to fly and the battery lasts noticeably longer. For my third flight, I was back in San Francisco to speak at the Canon Learning Center. I drove up to the city early so that I would have time to fly the drone. 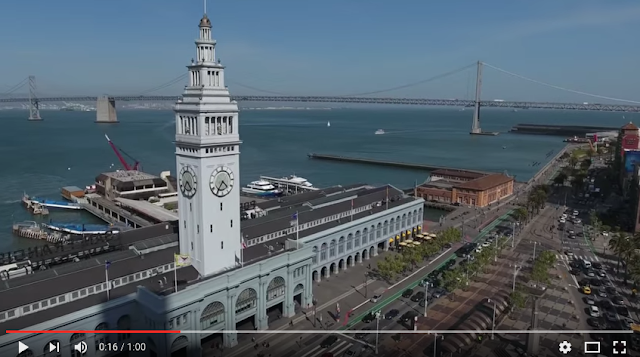 I ended up at the Ferry Building and thought that this would be the perfect place to try some of the new features of the Phantom 4 and accompanying software. The updated software has a host of new features, one of which can automatically follow any object or person. More on that later. The one new feature that I was most excited to try out was the auto circling feature. And wow - this worked out beautifully! As you can see, I was able to fly a perfect circle around the Ferry Building. In the past, I have tried this countless times, but have always found myself either over or under rotating. But now I can set a center point in the software (on my iPad), fly the Phantom 4 out to the distance I desire, set the speed and direction and fly perfectly around that point. Here is what I did for this video. I flew the P4 directly over the clock tower of the Ferry Building, set that as the center point, and then let the software do the rest. I am now in love with this new feature! I mentioned the auto tracking feature. but I had never actually tried it. I took a break from writing this blog and went outside to give it a try. 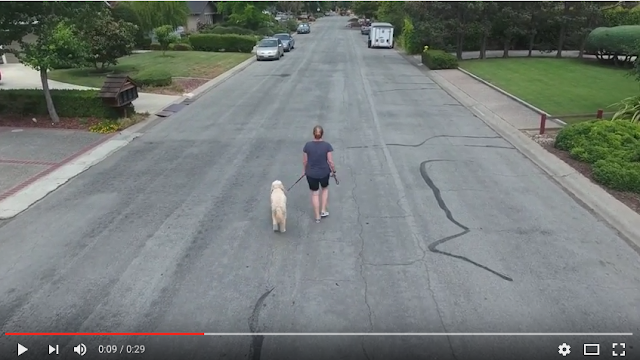 My wife was going to walk the dog, so I launched the P4 about 15 feet over them, trained the camera on them, tapped the iPad screen to identify them as my subjects, and hit "Go" on the screen. Here is what the Phantom captured. A nice smooth following of them. Pretty cool! 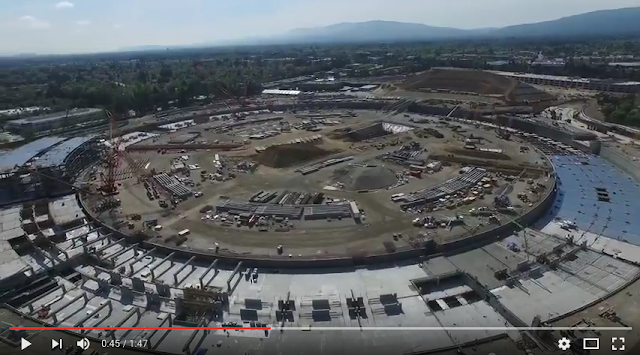 You may remember that in March of 2015 I flew my Phantom 3 over the construction site of the massive new Apple Campus that they are building in Cupertino, CA. Below is a new video taken last weekend, using the Phantom 4. You can see that they have made quite a bit of progress on the building. And DJI has made a lot of progress on their drones. 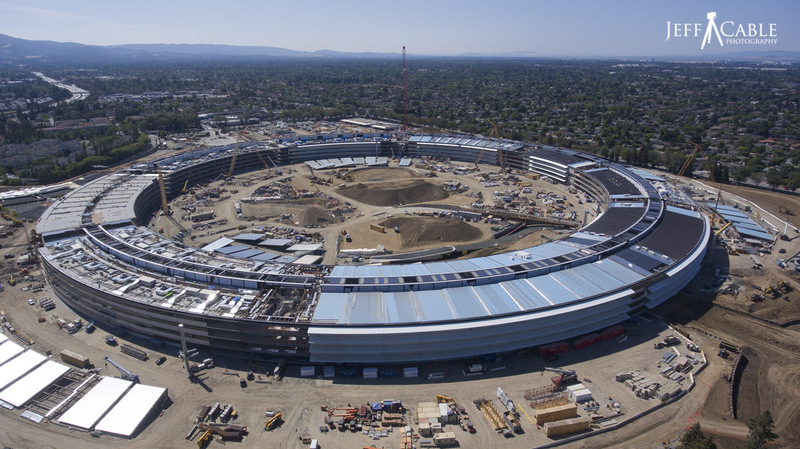 Not only is the newer drone easier to fly, but you will also see that the still and video quality is significantly sharper than before. Along with capturing video, I also made sure to grab some still photos as well. I love that the Phantom 4 lets me shoot both RAW and JPEG images. Whenever people see me flying the Phantom, they alway come up and ask me the same two questions. The first question is: How hard is it to learn to fly these things? For the which the answer is, It is really easy. The drone has GPS built-in, and the controls are incredibly easy to work, so it is actually simple. The second most common question is: How long does the battery last? The battery on the Phantom 4 seems to last about 25 minutes, which is really very adequate for most of what I shoot. I do recommend buying a second battery to give more flying time. * The camera gimbal are built MUCH better than on previous models. This makes them much less vulnerable to damage in event of a crash. * I love that the battery has a new charing port which can attach to the charging cable much easier than in the past. And the cable can be inserted in either direction, and still charge the battery. * The new more powerful motors allow for the Phantom 4 to move at speeds up to 40mph (in Sport mode). * The Phantom 4 does have a front facing obstacle avoidance system, which is really comforting to know. I actually tried this out, flying the Phantom directly towards my house. As it got within 4 or 5 feet, I heard an audible alert on my iPad and the drone halted it's forward progress. * I like the smooth plastic finish which seems easier to keep clean. At $1399 the Phantom 4 is not an inexpensive piece of equipment, but for what it does, I think that this is a bargain. I pay this type of money for a good lens, and the Phantom 4 includes the drone itself, camera, lens, gimbal and remote. The only thing that is not included is a tablet or phone, which is necessary to fly. But most of us have one of these anyways. I love how these devices make it possible for me to easily capture awesome quality video and still images to share with you all. Great stuff, Jeff. Will you be bringing it to Africa for us to play with? 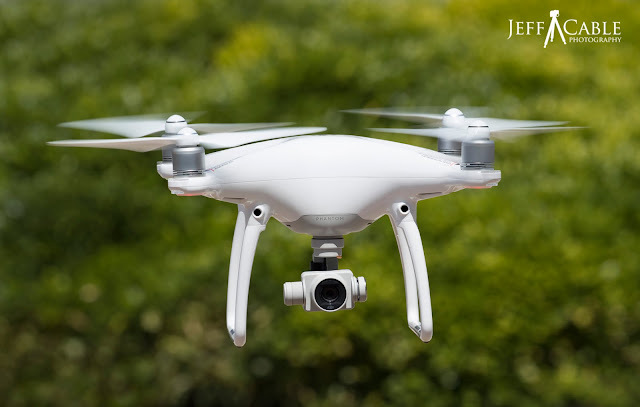 When you are choosing a drone to buy, it is really important to think about your own needs and abilities when it comes to drone flying. The most important for a new drone pilot should be educate yourself on the airspace regulations of your country, and the general rules of safe flying. Loved all the pictures taken from the DJI Phantom. Have you also posted any video?